TurnKey Coaching & Development Solutions is a global corporate coaching, executive coaching and leadership development company specializing in enterprise, fully managed coaching & development solutions and comprehensive corporate coaching programs. We provide professional, scalable, affordable executive coaching, corporate manager /high-potential coaching (emerging leader coaching & training programs), and integrated leadership development services to corporations, Human Resource Outsourcing companies. Our corporate coaching programs are carefully tailored to meet the specific needs of your leadership and executive coaching requirements including reliable program management, professional coaching programs to match your budget, sophisticated systems for metrics and coaching program analysis, development reporting and more. Our coaches are the best in the business and our careful screening and ongoing quality assurance process allows us to back-up our 100% satisfaction guarantee! From your coaching program concept and design phase through leadership coaching delivery to executive coaching feedback and post-program analysis, our systems and processes are designed to make your entire Corporate Coaching and Development Program an easy, hassle-free and extraordinary experience. We are your one-stop provider for scalable business coaching, corporate coaching programs and coach training solutions. We offer expert, business-savvy coaches who will help your executives, leaders, managers, and high-potentials achieve their professional and personal development goals, and we manage the entire process. 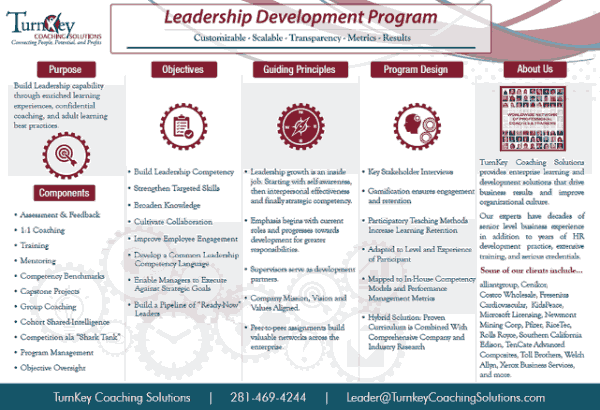 Additionally, we provide turnkey solutions such as coach recruiting and/or program development for corporations seeking to implement or improve upon their internal coaching program. For more information, Click Here. Our Leadership Development Programs build leadership capability through enriched learning experiences, expert training, confidential coaching, and adult learning best practices. Download our Leadership Development Program brochure here. 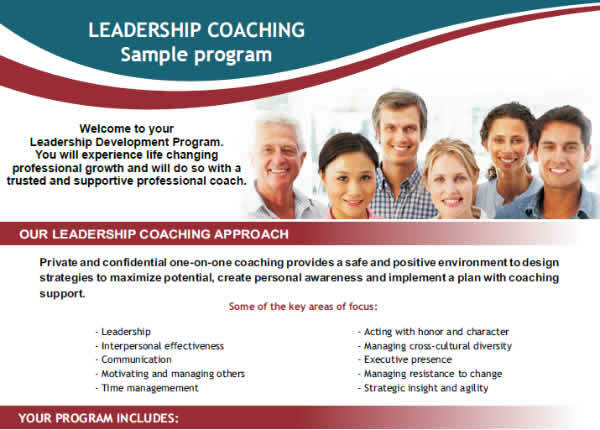 Download a sample flyer outlining our one-on-one Corporate Coaching Program which is customized to be an ideal match to the level, experience, and goals for each leader. Your satisfaction is guaranteed! We offer a 30-Day, 100% satisfaction guarantee. If you are not completely satisfied with your coaching experience, then all you need to do is let us know within the first 30 days and we will unconditionally refund your money! 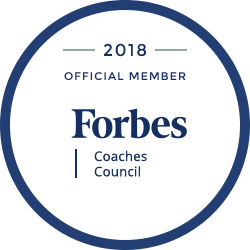 Additionally, at any time throughout your coaching program should your coach not meet your expectations, a new coach will be immediately assigned until your employee or client is not only satisfied but enthusiastic about their coaching program and professional coaching experience. We would be delighted to schedule a FREE CONSULTATION to talk with you about your needs and what we can do to support your goals! Call us: 281-469-4244, or you can also Contact Us by completing our on-line form. Please indicate the areas that you are interested in, and someone will contact you.